County Legislature Chairman Barry Leemann presents a proclamation to members of the Vision Network. Standing in the County Legislature Chambers, from left, are Ken Skillen, Jeremy Hanlon, Legislature Chairman Leemann, Sabine Ingerson, and Bea Welch. 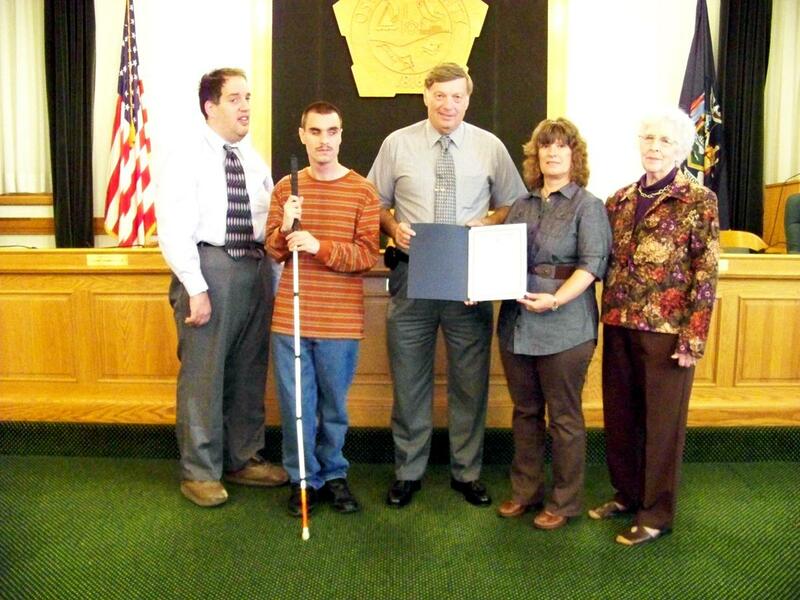 Oswego County Legislature Chairman Barry Leemann has designated Friday, Oct. 15 as White Cane Safety Day and urges the public to be considerate of those who live with visual impairments. 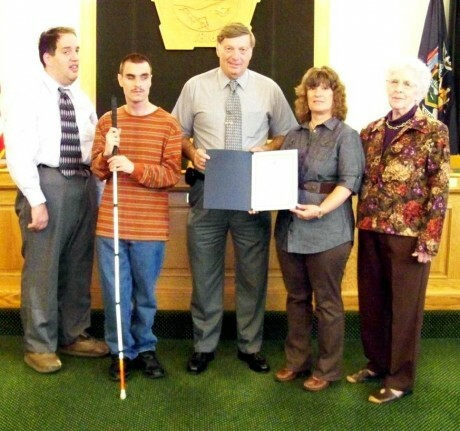 A white cane is used by those with vision impairments to help with mobility and independence of day to day tasks. Vision Network’s mission is to improve the quality of life and create a sense of independence for Oswego County residents of all ages who have vision related needs. The organization conducts public education programs and advocates for those with visual impairments. “We ask people to keep in mind and be alert while driving to those with vision loss,” said Sabine Ingerson, director of ARISE. Ingerson said a new safety issue has emerged with the increased use of hybrid vehicles. For more information on Vision Network of Oswego County, call 342-4088 or visit the web at www.ariseinc.org.